Nigeria is a nation in Western Africa with a population estimated at over 170 million. It is the most populous country in Africa and the seventh most populated country in the world. Sadly, the country is also largely comprised of practicing Muslims, including the militant jihadist group Boko Haram, which seeks to establish Sharia law in the nation. 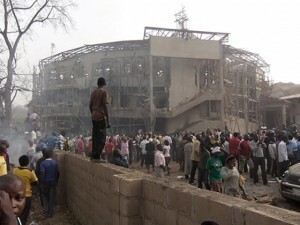 Boko Haram has progressively been inflicting great persecution upon Christians in the land. Therefore, the organization has decided to do something about it. The Stefanos Foundation describes itself as ‘the rising hope of the persecuted’ as it works to bring hope to a troubled nation while working for peace and justice. Some of their featured projects include widows support, care of orphans, trauma counseling, advocacy/media awareness , and rehabilitation/reconstruction of burned and damaged homes while providing micro-funding to small businesses and helping establish self-supporting enterprises. The foundation also provides advocacy and legal aid for those imprisoned and suffering injustice throughout the region. They state that their goal is to serve God’s Church by speaking as advocates for the persecuted while showing Christian love and compassion to all parties involved. Additionally, Stefanos explains that they have been involved in evangelism efforts as well. They have facilitated a radio program that broadcasts God’s Word to the unreached people of northern Nigeria, and have also been providing support to pastors in crisis prone areas. Through this, they offer leadership training, as well as free Bibles and Christian literature on how to love their persecutors to Christ. The Stefanos Foundation says that there are many ways that Christians can help the persecuted church in Nigeria and join hand in hand with their efforts at this difficult time. Prayer support, financial donations, and purchases of the ministry’s books, such as “Religious Tolerance,” which outlines the negative effects of Sharia and the persecution of Christians in each of the country’s fifteen states, are all appreciated, the ministry advises. Heather Clark contributed to this article.